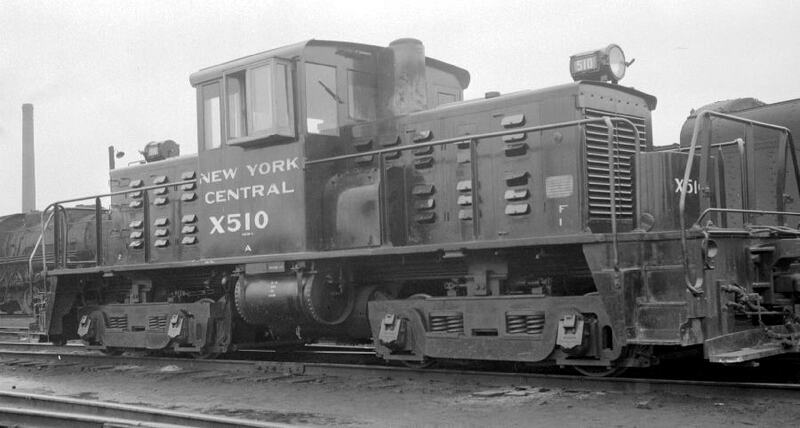 In 1942 General Electric built eight 70 ton center cab diesel locomotives for the New York Central. Numbered 506-513, they were among the first 70 ton switchers built by GE. Originally intended to be used switching passenger cars in terminals, these locomotives proved to be geared too low for that service and were reassigned to other duties. Some were made into shop switchers while at least one other went to Despatch Shops as a shop switcher. The two locomotives, which started life as NYC 512 and 513, then SSX 40 and 41, finally wound up at Valley Mould as 6114A and 6114B. The 6114A was used primarily for switching scrap cars at the melt shop while 6114B was used as a general plant switcher and for moving bottle cars of molten iron from the melt shop to the foundry. In 1992 Valley Mould closed its doors and a year later the plant was reopened as Ellwood Engineered Castings. Both were originally painted black but 6114B received a coat of read paint in the late 1990s in an attempt to more easily distinguish the two locomotives. In 2005 EEC realized that their two workhorses would not last forever (they had been in service for 62 years!) and decided to replace them with a pair of GE 80 ton locomotives. Ellwood Group approached the Tod Engine Foundation about preserving one of the locomotives as they recognized the historical significance of these locomotives. In December, 2008 Ellwood Engineered Castings donated the 6114B to the Tod Engine Foundation after both of the 80 tonners had been delivered and placed into service. 6114B will be moved to the Tod Engine Heritage Park where it will be exhibited with our growing collection of steel industry equipment. Please visit the Tod Engine Foundation website for more details. Photo by Gary Stuebben from George Ellwood’s Fallen Flags web site.